Advantages: Packed with attractive profiles; many and varied markings across all major inter-war single engine aircraft; logically organised by aircraft type; detailed and useful captions describing ops, colours, markings and unusual features; specific references cited; great source of inspiration for modellers. Aviation Workshop's third "On-Target Special" focuses on the fascinating but largely ignored arena of RAF inter-war colours and markings. "Wings of Silver - The Silver Years of the RAF 1919-1939" is written by Mike Starmer and illustrated by Peter Freeman. Mike Starmer is probably best known as an authority on British and Commonwealth armour colours, but he clearly has a long-standing passion for this mysterious subject as well. In common with earlier titles in the series, this 76 page soft-cover book is crammed full of artwork of the subject - in this case literally hundreds of illustrations of a very wide selection of single engine RAF fighters, trainers and bombers. Many of the aircraft are depicted in four-view diagrams on a full page. All the artwork is clean, clear and very attractive. The cover art, depicting a bombed-up Hawker Hart in flight, is especially nice. Aircraft types covered include Sopwith Snipe, Bristol F.2B, DH.9A, Avro 504K & N, Gloster Grebe, Hawker Woodcock Hawker Horsley, Armstrong-Whitworth Siskin III, Fairey Fawn, Fairey IIIF, Fairey Fox, Fairey Gordon, Gloster Gamecock, Bristol Bulldog, Westland Waipiti, Avro Tutor, Hawker Hart (and Hart trainer), Hawker Audax, Hawker Hind, Hawker Demon (including Hawker Turret Demon), Hawker Fury, Gloster Gauntlet, Gloster Gladiator, Hawker Hind and even the Hurricane prototype in silver dope and Spitfire K5054 in bare metal. The book is logically structured by aircraft type, and effectively documents the development of markings and colours from the close of the First World War until the last days before Europe was once again plunged into war. The fact that the vast majority of the subjects are finished in overall silver does not detract from their appeal or interest. Many aircraft carried tactical markings, theatre markings and squadron insignia and special colours, leaving a vibrant and unique stamp on aviation history. The only suggestion that I might offer is that it would have been nice to have a brief introduction to each aircraft - perhaps just a paragraph or two at the beginning of each section outlining the background and role of the type. I do hope that Aviation Workshop is planning to release accompanying decal sheets as they have for most of their previous publications. The old Impact 1/48 scale Fury and Bulldog kits hail from the 1960s but are still quite respectable, Roden's Gladiator is very nice indeed, and I even have an Aeroclub Gauntlet stashed away somewhere. We are also seeing a growing range of 1/72 scale inter-war aircraft emerging from Eastern Europe. Many of these subjects would make fine three dimensional canvases for decal subjects from this new book. The "On Target Profiles" series has demonstrated a proven formula for delivering a wide selection of interesting colour and markings information in an attractive format. 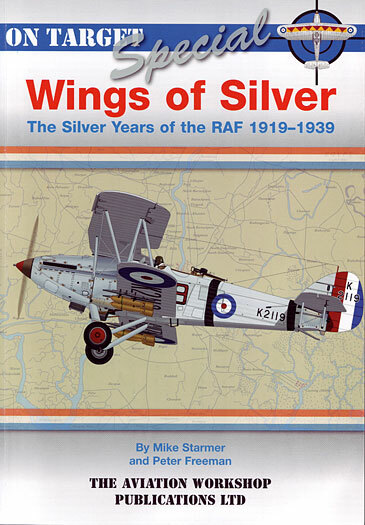 "Wings of Silver - The Silver Years of the RAF 1919-1939" is a terrific title that addresses a sadly neglected area, and will be an ideal one-stop primer on the subject for modellers and aviation enthusiasts alike.